This powder is in the hetero-amorphous phase. 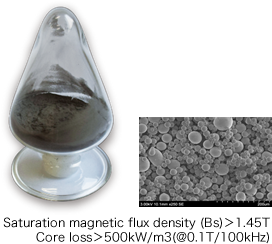 It is made from iron particles, under about 2nm in size that are nearly crystalline in structure and that are in the amorphous phase – which has random atomic placement, put into high concentration. 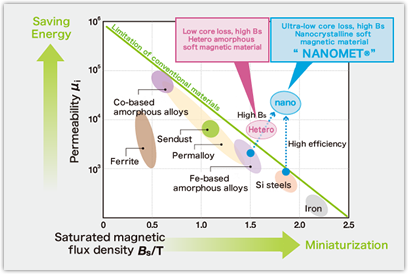 It keeps in the amorphous phase, even with an iron density, that is higher than previously possible, giving it both high saturation magnetization Bs and low loss. Crystalline structures that are alloys made of highly-densely dispersed alpha-iron crystals (nano crystals) in the amorphous parent phase of the nano-order are called nano crystal alloys. 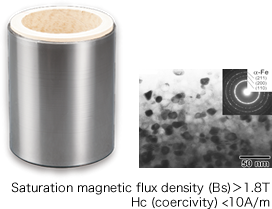 NANOMET® ribbons have unmatched high saturation magnetization and ultra-low loss as compared to other nano crystal alloys, and don’t require expensive materials such as Nb. Ultra low-loss nano-crystal soft magnetic materials are revolutionary materials that provide performance capacities that defy conventional knowledge of soft magnetic materials up to now because they have the same low iron loss as con-ventional high permeability materials, while also having the same high Bs levels as silicon steel. The iron loss in transformers and motors, which takes up the most overall power usage, is said to account for 3.4% of the total generated power that is consumed in Japan, and this translates to 33.5 billion kWh of lost power every year. 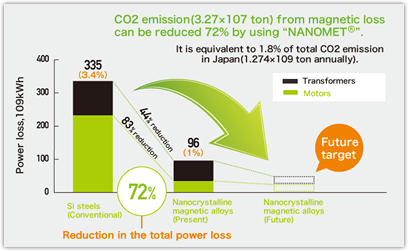 If the silicon steel in all of the transformers and motors in Japan were replaced with NANOMET® , it would be possible to cut lost power by up to 72%, depending on how they are used.